Sweden is progressive in many areas and the environmental awareness is generally quite good. However, we seem to have developed a collective blind spot when it comes to a habitat which was once our most defining one: the unexploited temperated forest. Sadly the forestry companies have successfully convinced us that what they are doing is 1) a responsible way of caring for our beloved environment and 2) a crucial part of our economy. Neither of which is true. The ecosystem which once covered the majority of our country has been exploited to a point where only a few percent still remains. Instead we have replaced this unique and highly diverse form of nature with vast areas of something entirely different: planted forests. In fact, calling them forests are misleading – by comparison, they are little more than sterile monocultures with identical trees of same species and age, ordered in straight lines. While the background is rather dark, we've chosen a more positive approach in this book. 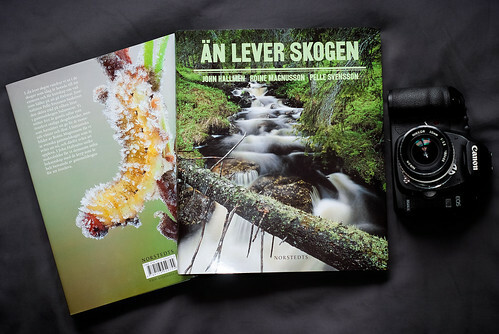 The Swedish title "Än lever skogen" translates to "The forest is still alive". They may be scraps of what they once were, but at least there still are some beautiful unexploited forests left in our part of the world. A large part of the problem is that most of us are unaware of what we stand to loose. This book aim to shed some light on this. We want to show what a true forest looks like and put a face on some of those latin names of species we're supposed to care about without ever having seen! The book is a collaboration between Roine Magnusson (nature/landscape photographer), Pelle Svensson (author) and me. It's being published by Norsteds (in Swedish, initially) and hits the shelves now (September 2013), a year past my first book "Kryp" (2012). 211 pages, 290 x 250 x 20 mm, 1554g. Language: Swedish. At least in Sweden you should be able to get it at most bookstores including the online ones (bokus» or adlibris»). See comment below for thumbnails showing a selection of spreads from the book.